The orphanage where 4 year old girl Elo Ogidi was found has been shut down by the Edo State Government. God’s Own Orphanage in Benin was shut by the Edo State Government, following the discovery of a missing Elo Ogidi. This was made known in a statement by the Special Adviser to Governor Godwin Obaseki on Media and Communication Strategy, Crusoe Osagie, on Friday. According to the statement, three other children were found without proper documentation during a visit by officials from the Ministry of Women Affairs and Social Development to the facility. 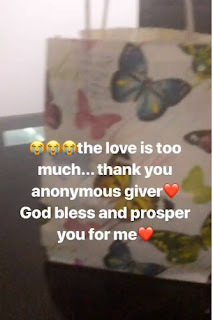 Elo was reported to have been stolen during a church service she attended with her parents at the Christ Embassy in Oregun, Lagos, in July but was found at the orphanage on August 24. The proprietress of the facility located in the Siluko area of Benin, one Mrs. Kehinde Imarigbe, had later been arrested and detained by the state police command. 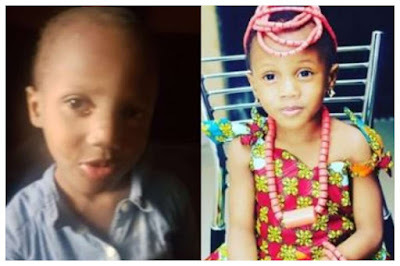 Imarigbe, who was paraded on Tuesday, had alleged that the little girl was brought to her orphanage on July 8 by one Mr. Chukwuma, who she said claimed to be her (Elo) father. She had also claimed that her centre was registered by the ministry and had been in operation for four years with 15 children. But the Commissioner for Women Affairs and Social Development, Magdalene Ohenhen, said that the management of the children’s home did not follow due process in admitting Elo into the centre. Ohenhen, however, noted that the remaining children at the orphanage would be moved to a safer centre. She also said that the children would be placed under the care of the state government, pending when the investigation on the activities of the home was concluded. 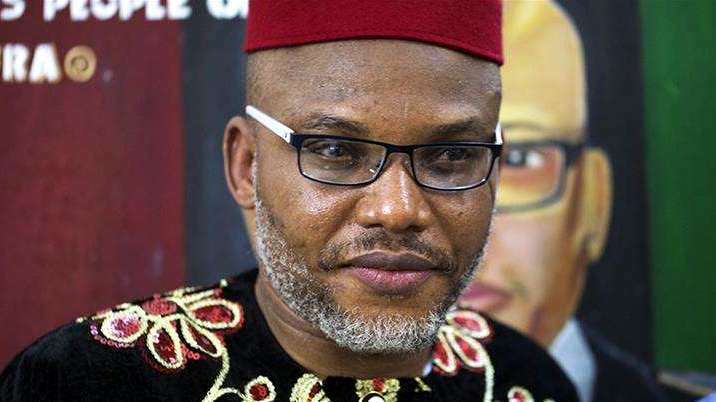 This is coming almost two weeks after over 100 IPOB women were detained after a protest in Imo State demanding the release of Nnamdi Kanu, the leader of the group. The women were later released a week later by a Magistrate Court in Owerri, Imo State capital, after campaigns and demands for their release, especially on social media and by global rights groups such as Amnesty International. Clashes occurred between IPOB members and soldiers when the military commenced an operation in the South-east states last September. This left scores of casualties mostly on the side of IPOB and since then, whereabouts of Mr Kanu who is wanted by the Nigerian government for alleged treason has remained unknown. Also, speaking in an interview on BBC in February, Mr Kanu’s wife, Uche Kanu, maintained that the Nigerian Army should tell the world what happened to her husband, saying nobody in his family knows whether he was dead or alive. While the federal government proscribed IPOB and labelled it a terrorist organisation in the wake of the clash, the U.S. government, however, said it does not see IPOB as such. He said they are carrying out the exercise to protest the invasion of the country home of its leader, Nnamdi Kanu, same date last year. He said inhabitants of South-East/South-South and all conscientious Biafrans living in other parts of Nigeria and the world are required to stay indoors and away from work or daily business activities throughout the said day. The youth wing of Ohaneze, an Igbo socio-cultural group, has endorsed the sit-at-home order by IPOB. “Sit at home is a welcomed idea,” it said in a statement. It however appealed to the group to carry out the exercise in a peaceful manner. “Any action of IPOB that is peaceful is welcome. Sit at home is a welcomed idea. 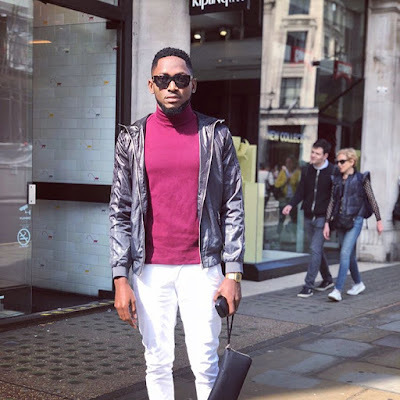 That is what we have been saying that IPOB is not a terrorist organisation, they are a peaceful organisation,” Uche Achi-Okpaga the group’s spokesperson said in a statement Wednesday. “It is the Nigerian Army and government that is deploying all these ploys to make them look violent but all their actions are always peaceful and cordial”, he added. Mr Achi-Okpaga warned the military not to capitalise on the sit-at-home to attack IPOB supporters in the region. “There is nothing wrong with asking you to sit at home. If you want to sit at home you sit at home, if you dont want to sit at home you go about your normal business. “Ohaneze will not be against that move but we don’t want them (the army) to capitalise on that to be killing our people,” he noted. Also endorsing the order was the national leadership of All Nigerian Ethnic Nationalities Youth Organisations. The group said it would interface with governors of the South-east to ensure there is no breakdown of law and order during the September 14 sit-at-home. Okechukwu Isiguzoro, the groups’ deputy national chairman, advocated an exercise devoid of violence, insisting that IPOB must change its strategy and ensure people’s lives are not lost in their struggle for self-determination. He urged security agencies to ensure that there was no confrontation with IPOB on the day of the sit-at-home exercise. Netherlands national coach Ronald Koeman announced a 25-man squad Friday to face Peru in a friendly in Amsterdam next week, to be played in honour of Sneijder, a former Ajax, Real Madrid and Galatasaray midfielder. “This is the final time Wesley Sneijder will form part of the selection camp,” the Royal Dutch Football Federation (KNVB) said in a statement. “The record-breaking international ends his national football career officially on Thursday with 133 caps to his name,” it said. One of the great playmakers of his era, Sneijder, 34, remains a versatile and always energetic midfielder. He surpassed former goalkeeping great Edwin van der Sar’s Dutch national 130-match record in June 2017 on his 33rd birthday. He also finds himself in a small group of players who have been capped more than 100 times by the Netherlands, including Frank de Boer, Rafael van der Vaart, Giovanni van Bronckhorst, Dirk Kuyt, Robin van Persie and Philip Cocu. Known as the “Little Big Player”, Sneijder made his debut for the national squad in 2003 against Portugal. 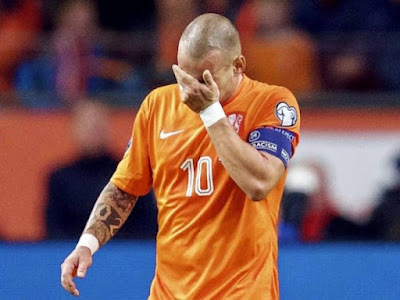 There were many highlights in his career, but Sneijder will be especially remembered for his header during the 2010 World Cup quarter-final against Brazil which the Dutch won 2-1. It was Sneijder’s first-ever international goal with his head. The Oranje went on to lose 1-0 to Spain in the final. He got some revenge four years later while making his 100th appearance, when the Netherlands demolished Spain 5-1 in Salvador in Brazil during the 2014 World Cup. 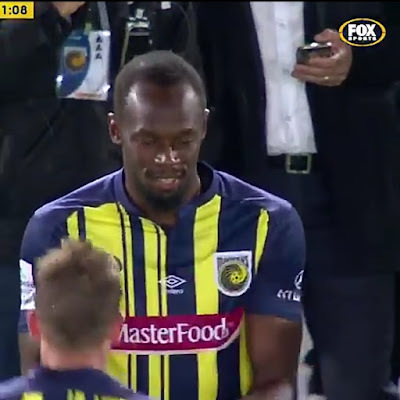 Sneijder, who won the Champions League under Jose Mourinho at Inter Milan, currently plays for Qatari club Al-Gharafa. 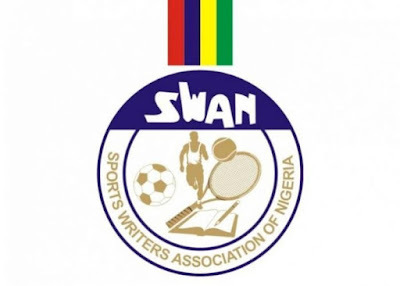 The Sports Writers Association of Nigeria (SWAN) Lagos State Chapter have dissociated itself from the national body. This is contained in a communique issued after the association’s emergency congress held at Lagos SWAN Secretariat, National Stadium, Surulere, Lagos on Friday. The communique reads:” In view of the fact that due process was not followed in the purported registration of the Sports Writers Association of Nigeria at the CAC, Lagos SWAN dissociates itself from the registration and the current leadership of National SWAN until these issues are satisfactorily determined. 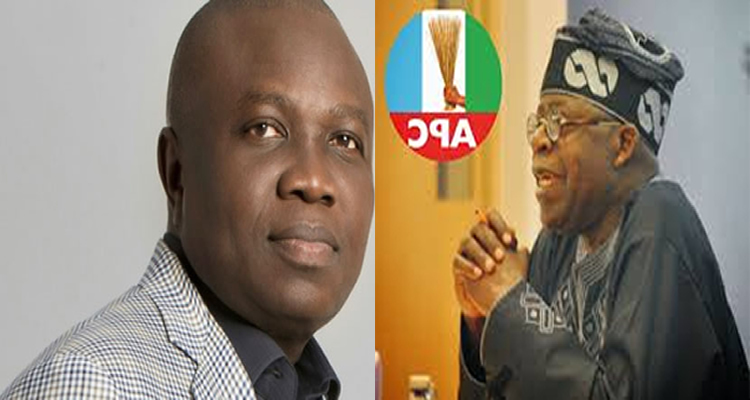 “Lagos SWAN is not aware of any meeting at which the Trustees were elected or appointed or ratified. Lagos SWAN also disagrees with the lack of due process in the suspension of the Deputy National Secretary, Wale Joseph, by the National Executive Committee. “We find it undemocratic for any punitive action, no matter how tentative, to be taken against member without any hearing whatsoever. “Furthermore, we consider it dangerous and against the interest of freedom of expression for members to be punished for expressing their opinions on issues at state congresses as is the case for which Wale Joseph has been persecuted. “This in our view, is a sure part to dictatorship which is capable of destroying the association. “Lagos SWAN considers it unsafe for the interest of the association for the National Secretariat to be run without any of the elected National Secretary and the Deputy National Secretary. Roughly 50 days after the 2018 FIFA World Cup tournament was concluded, FIFA has reckoned that the Russia hosted mundial was a successful phenomena football fiesta. “Because he has to improve, just in order to play my football,' the Chelsea coach said”. “He has great qualities from a physical point of view, and technical point of view. I think he needs to improve from the tactical point of view, nothing else”. “I think that he will be important for sure. Starting in September, we will play every three days, so Loftus will be very important and useful for us”. “It's not easy to play here, because here there are 20, 25 very good players, so it's not easy to play in the starting XI, but I think if he will improve more, he is ready to play from the beginning”. “I can say that I am really very happy with him because, in the last 10 days, he has improved a lot. So we're really very happy with him”. Tammy Abraham is linked with a loan move to Championship Aston Villa before the elapse of the window. “Maybe Tammy,' Sarri said. “It's up to him. I am not able to guarantee to him a spot at the moment, but if he wants to remain, I'm really very happy with him”. 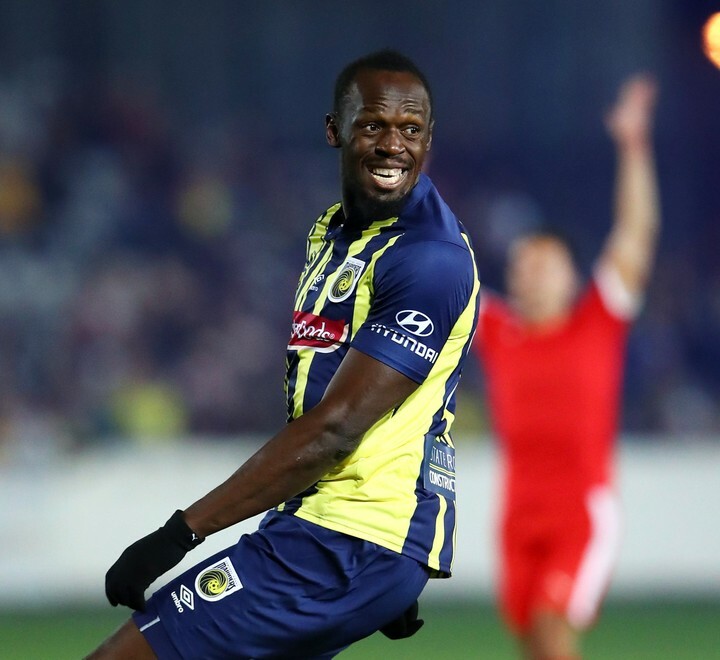 “He's very young for a striker, and can improve more. I think it's up to him”. The Sokoto State Government, has confirmed nine deaths due to what an official suspected to be cases of gastroenteritis in seven Local Government Areas of the state. 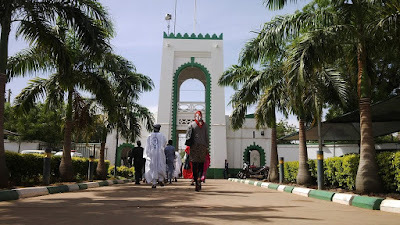 The Permanent Secretary, Ministry of Health, Mr Mustapha Ali, on Friday in Sokoto, listed six of the affected LGAs as: Illela, Sabon-Birni, Gada, Goronyo, Isa and Tureta. Most of the LGAs border Republic of Niger. Ali stated that the situation is under control, as the state and federal government officials had been deployed to the affected areas while medications and other aids had also been made available. He, however, debunked the claims that it was an outbreak of cholera, noting that experts had since taken samples for laboratory test in line with standard practice. Ali said 80 patients were hospitalised in Tureta town and its suburbs, adding that all the deaths are those recorded within theprimary health care centres and hospitals. Nonetheless, he insisted that it was irrational to attribute other deaths to the gastroenteritis, as routine deaths occurred daily naturally at different places. Ali also confirmed the death of one person, which occurred at Internally Displaced Persons (IDPs) camp in Gandi village. He cautioned people against unwholesome food and water consumption and urged hospital workers to be on the alert by living up to the expectation of their services. President Muhammadu Buhari has publicly told visiting German Chancellor, Angela Merkel, his government does not support Nigerians trying to illegally enter Europe, saying those caught would be “at his or her own risk”. 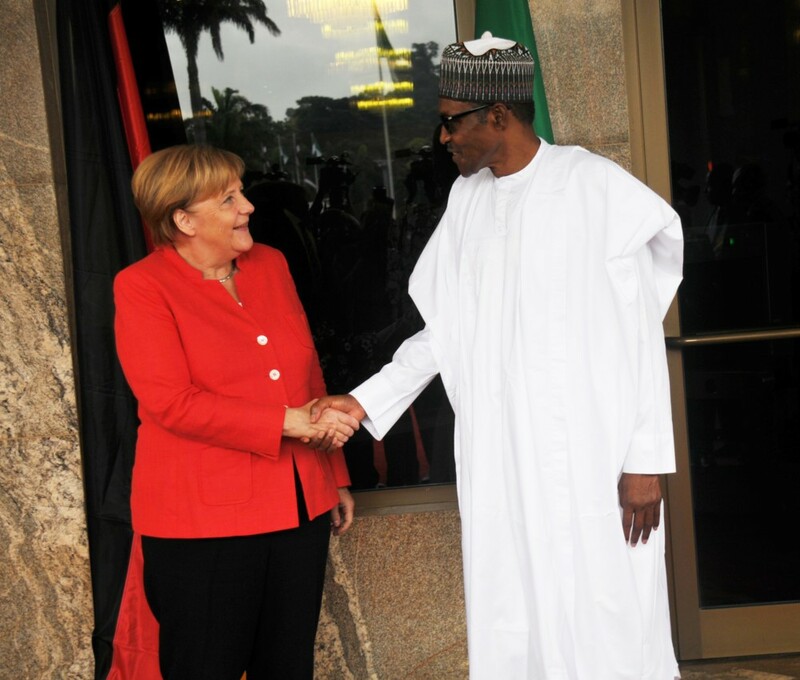 German Chancellor Angela Merkel on Friday morning arrived Nigeria and was received by Mr Buhari at the presidential villa in Abuja. Mrs Merkel’s visit to Nigeria marks the final part of her three-day trip to West Africa countries: Senegal, Ghana and Nigeria with a focus on strengthening economic development and containing illegal migration. Her visit comes two days after the British Prime Minister, Theresa May, visited the country with plans to increase trade and investment between Nigeria and the UK. 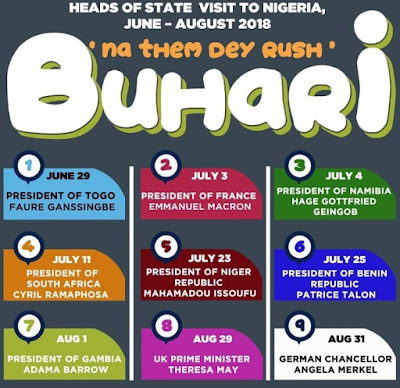 President Buhari, who welcomed the German Chancellor at the forecourt of the presidential villa, introduced some members of his cabinet and presidential aides to his visitor before going into closed door meeting to deliberate on issues of mutual interest to both Nigeria and Germany. After the closed door meeting, both leaders addressed the press briefly. During the briefing, Mrs Merkel tasked Mr Buhari to ensure a free, credible and fair election in the fourth coming 2019 polls. “I appeal that the fourth coming elections in Nigeria should be free, fair and credible. It should not result to chaos or complete breakdown of law and order. A credible election is an important aspect of democracy and good governance,” she said. 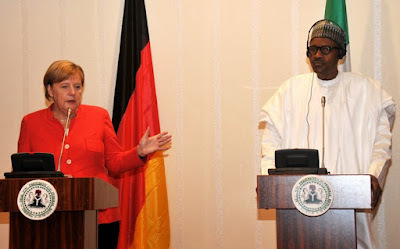 The German leader said she was aware that Nigeria is facing many security challenges. About 7,000 members of the Peoples Democratic party (PDP) in Delta State, including two aides of Governor Ifeanyi Okowa, have dumped the party for the All Progressives Congress (APC) in the state. The decampees, mainly from Oleh community and its environs in Isoko South local government area of the state, defected alongside Mr Lucky Arumare, Special Assistant to the Governor on Youths and Community Development, Mrs. Uyoyou Edhekpo, Special Assistant to the Governor on Women Mobilization. The based their decision to dump the party on alleged high handedness, and continued imposition of candidates by the leadership of the party, alleging that the PDP as a party portends “evil with fake ideologies”. At the Oleh primary school ground where the decampees formally announced their exit from the PDP on Thursday evening, they vowed to mobilize against PDP in the state and the local government area, adding that their defection from the PDP was an indication of victory for the APC. Receiving the defectors, the state chairman of the APC, Prophet Jones Erue boasted that Governor Okowa will be shown the way out during the 2019 general election, alleging that there has been decay in infrastructure, and under development in the state in the past three years. According to him, “Governor Okowa is serious apology to Delta State. He will be shown the way out from Government House by Delta people through their votes. The people have concluded to enthrone an APC government come 2019 in Delta State. PDP has nothing to offer to the people of Delta State”. Arumare, former aide to Governor Okowa, who spoke to journalists on behalf of the others, alleged that PDP operates as a “cult group”, adding that members who are not part of the “cult group” were not recognized in the scheme of things. He said, “We have dumped PDP. We will not go back to the party that operates like a cult group. We were tired and moved into light where we can pursue our political career. We will shock the party come 2019 with our votes. APC has transparent ideologies we will operate with”. 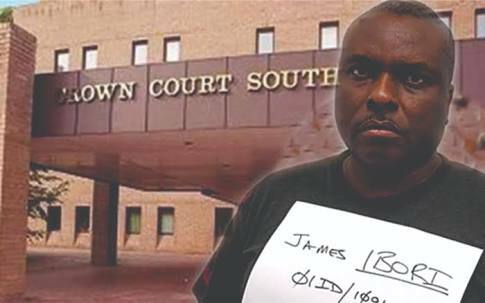 Meanwhile, sources close to Chief James Ibori , a two-time former governor of the state hinted that all was now set for him to dump PDP for APC in the next few days, as a source who did not want to be mentioned in the print, quoted Ibori as saying: “PDP send me to jail, APC released me. We are taking steps very soon”. Wife of the President, Mrs. Aisha Buhari, has promised to support female politicians aspiring for political offices across party lines. According to a statement on Thursday by her spokesman, Suleiman Haruna, the President’s wife spoke while receiving members of a political group, the South-East Women for Buhari, at the Presidential Villa, Abuja on Wednesday. She said Nigerian women should occupy political offices to make a difference. “‘Women need to be in political offices for them to make a difference in the lives of their families,’ she said, promising “to support female aspirants across party lines,” the statement read. Mrs. Buhari commended women members of the ruling All Progressives Congress in the South-East for doing a wonderful job by mobilising women. “It is a fact that women determine the outcome of elections; therefore it is important to mobilise more women to ensure that our great party is re-elected to continue the good work that it is doing,” she said. She also attested to the success of the mobilisation drive which she said had resulted in a high number of women aspirants from the geopolitical zone. She expressed the hope that the mobilisation would lead to a more peaceful elections that would produce more able and competent women to take over as many offices as possible, especially at the grass roots. 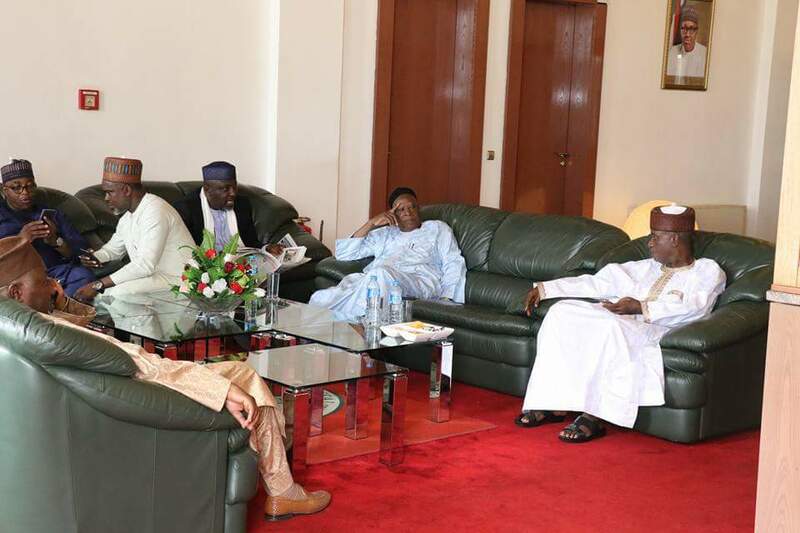 Mrs. Buhari called on officials and members of the APC to ensure party supremacy, respect party constitution and shun divisive tendencies. She also called for more inclusion, especially of women. Earlier, wife of the Imo State Governor, Mrs. Nkechi Okorocha, who led the delegation, said the women came to congratulate Mrs. Buhari on her recognition by two Korean universities and to present the South-East Women for Buhari, a political group in support of the ideology of President Buhari to her. 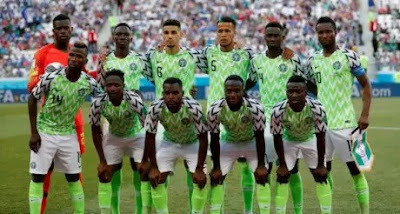 The Coordinator of the group, Mrs. Juliet Ibekaku-Nwagwu, said the President had done well in all respects and deserved another term in office. That, she said, was why they formed the group to ensure that the South-East stood behind Buhari in the next general elections. The event was attended by women party leaders including the National Woman Leader of the APC, Salamatu Baiwa, National President of National Council for Women Societies, Mrs. Gloria Shoda and Dame Pauline Tallen. 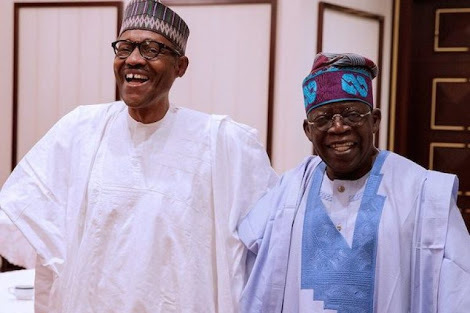 The National leader of the All Progressives Congress, Asiwaju Bola Tinubu, says the party is in the advantageous position to retain Osun governorship seat in view of the performance of the outgoing governor of the state. 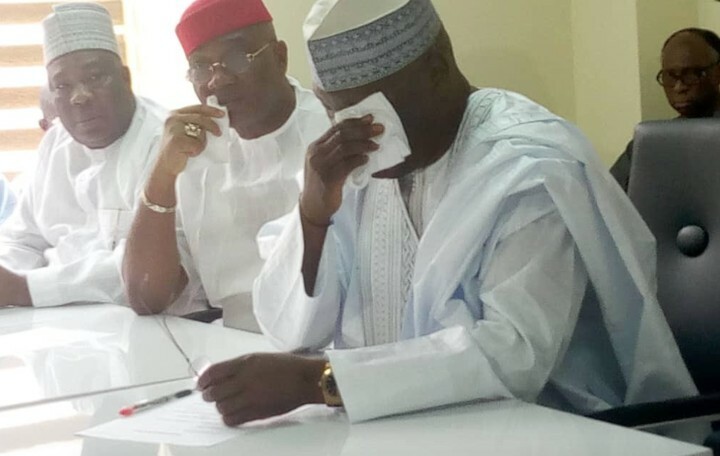 The News Agency of Nigeria (NAN) reports that the Independent National Electoral Commission (INEC) has fixed Sept. 22 for the conduct of the Osun State governorship election. The APC chieftain stated this when he fielded questions from State House correspondents at the end of the meeting of APC South West Caucus at the Presidential Villa, Abuja, on Thursday night. According to him, the administration of the outgoing Osun state Governor, Rauf Aragbesola, has put in place good foundation for the party to retain the governorship seat in the state. “We expect victory. We have a progressive government there where the incumbent and the outgoing governor has worked and laid a good foundation.“Therefore, we have successes to build upon. On whether the Osun election would be a hard fight like what obtained in the Ekiti governorship election, Tinubu said he could not predict what will happen but the APC would emerge victorious at the end of the exercise. He said: “You don’t predict the activity of elections. It can always be unique from one state to the other. Gov. Abdullahi Gamduje, who is the chairman of the Osun Governorship Campaign Council, also told the correspondents that President Buhari had blessed the Campaign Council, and hence the APC was in a better position to win the governorship election. He explained that the purpose of the meeting with President Buhari was to create an inclusive atmosphere so that they would face the election squarely. 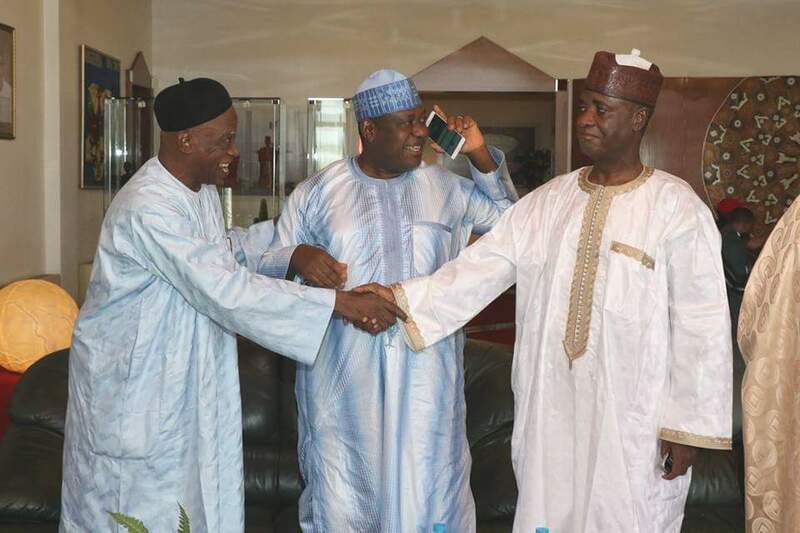 “From what has transpired, all those who contested, the aspirants that lost the election, they have pledged their loyalty, commitment and that they are part and parcel of the election campaign. “So, that is very encouraging. And also other stakeholders have made their commitments in order to win this very important election. “And most importantly is that Mr President has blessed the Campaign Council. 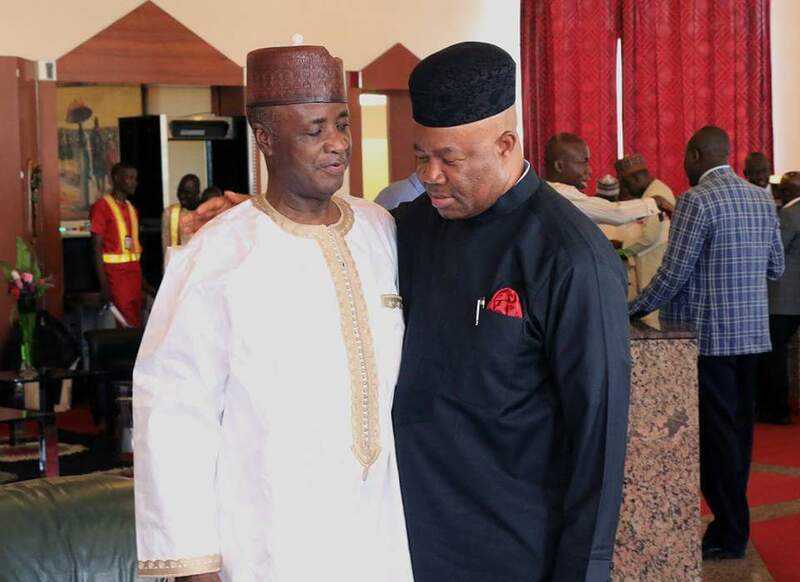 “He has appreciated those aspirants who lost the election and he appreciated also the commitment of all those who matter in the South West geopolitical zone APC politics. “I think that is very encouraging for us,’’ he maintained. In his contribution, the Osun State Governorship candidate for APC, Mr Adegboyega Oyetola, expressed appreciation to President Buhari for his commitment toward ensuring victory for the party in the election. “It shows that he is the father of all. He is committed to APC winning the Osun election come Sept. 22. “He is committed to our party retaining the government; he is committed to free and fair elections. And I want to say categorically, that by the grace of God, we are winning that election on the Sept. 22,’’ he added. The meeting was attended by Vice-President Yemi Osinbajo, APC national chairman, Comrade Adams Oshiohmole, Asiwaju Bola Tinubu, South West APC NEC and NWC members as well as Governors of Osun, Ondo, Oyo and Kano states. Former President Goodluck Jonathan has assured aspirants to elective positions in 2019 general elections of level-playing ground in the primaries to be conducted by the Peoples Democratic Party (PDP). 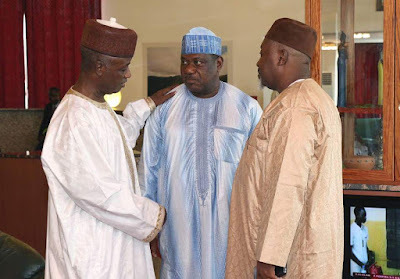 He gave the assurance while receiving former Governor of Sokoto state, Alhaji Atihiru Bafarawa, on Friday in his office in Yenagoa. As the 2019 general election draws near, political parties and their candidates have begun to sharpen their tools and all that is necessary to ensure victory at the polls. 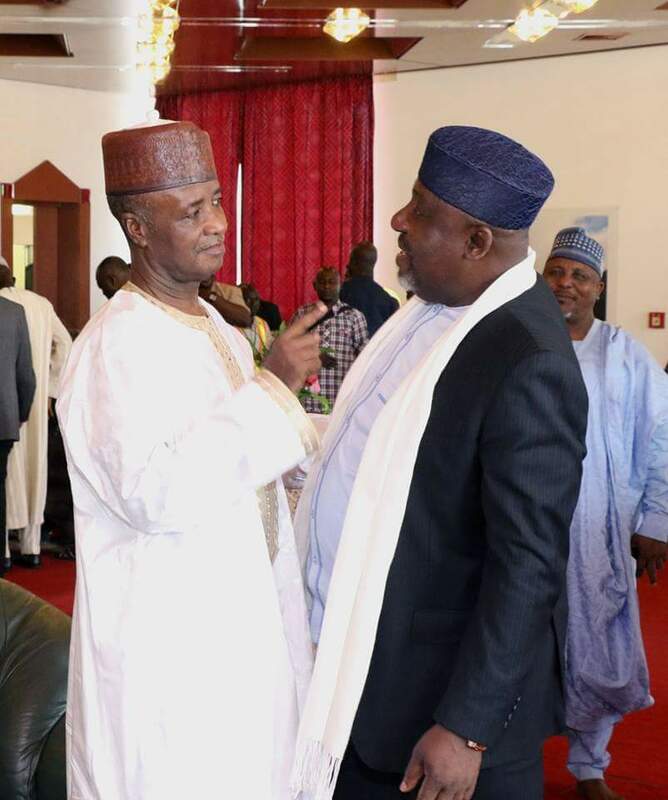 This election, is already looking like the most interesting one yet, both new and seasoned politicians are all gearing up to make a mark in Nigeria’s political history. 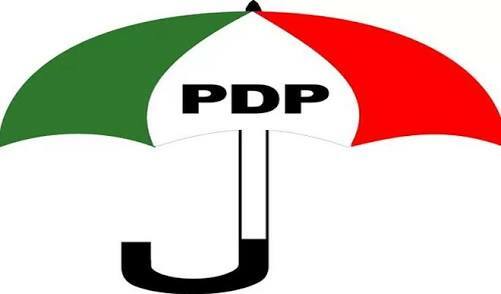 With the mass defections from the All Progressives Congress(APC) by politicians gunning for the seat of the president, and knowing the party has reserved the slot for the incumbent, President Muhammadu Buhari – Hence the shift to the Peoples Democratic Party(PDP), in order for them to clinch their dream position. 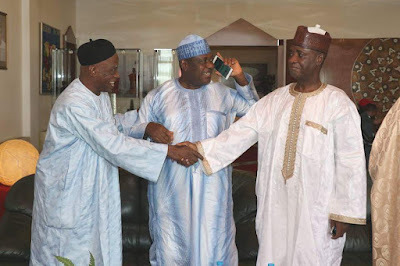 This shift, has made the choice for who will represent the PDP in next year’s presidential election a tough one. The consultations have begun, as candidates have met/and continue meeting with regions and persons that they know will play a vital role in actualising their presidential dream. Former Vice president of Nigeria from 1999 to 2003. President of the Nigeria’s Senate since 2015. He was formerly the Governor of Kwara State from 2003 to 2011. Presently the Governor of Sokoto State. He was elected as governor after the April 11th General Elections. He a Speaker of the House of Representatives of Nigeria before he became governor. He was two times Governor of Kano State from 1999–2003 and 2011–2015. He served as Foreign minister of Nigeria from 1999 to 2003. He was elected governor of Jigawa State in April 2007. 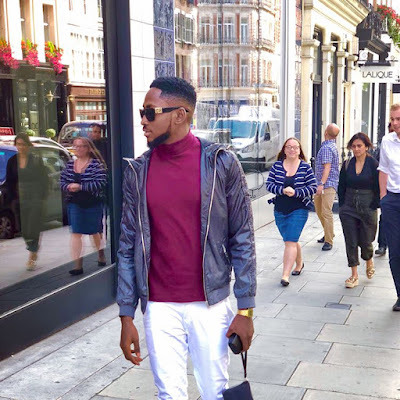 Former Minister of Special Duties in the administration of President Goodluck Jonathan. Former Chairman of the People’s Democratic Party. He was governor of Kaduna State in Nigeria from 29 May 1999 to 29 May 2007, and was elected Senator for Kaduna North in April 2007. He was governor of Sokoto State in Nigeria from 29 May 1999 to 29 May. He founded the Democratic People’s Party (DPP) and became its presidential candidate at the 2007 presidential elections in Nigeria. He is a former Nigeria’s minister of education and two term Governor of Kano State in Nigeria. He was elected in April 2003 and reelected in April 2007. Nigerian popstar, Davido will clearly not be spending the mandated 3 weeks in camp for his NYSC programme as he just touched down in Boston ahead of his sold out 'Locked Up' concert tonight. 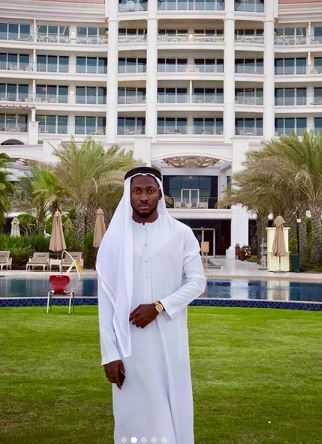 Davido made headlines a few weeks ago when he went to camp to register for the scheme and was back at the camp yesterday for the swearing in ceremony. Now he's currently in the United State to begin his tour. Chelsea have loaned English striker Tammy Abraham to ?Aston Villa for the remainder of the 2018/19 season. 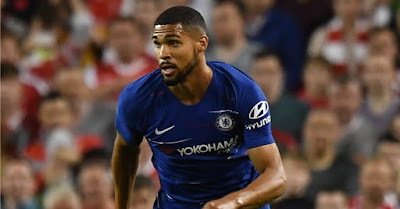 The 20-year-old was unlikely to get much game time under Maurizio Sarri this season as he was behind Alvaro Morata and Olivier Giroud in the pecking order, but he should be afforded reasonable minutes at Villa. "Aston Villa is delighted to confirm Tammy Abraham has joined the club on a season-long loan from Chelsea," Villa announced via their official website on Friday afternoon. 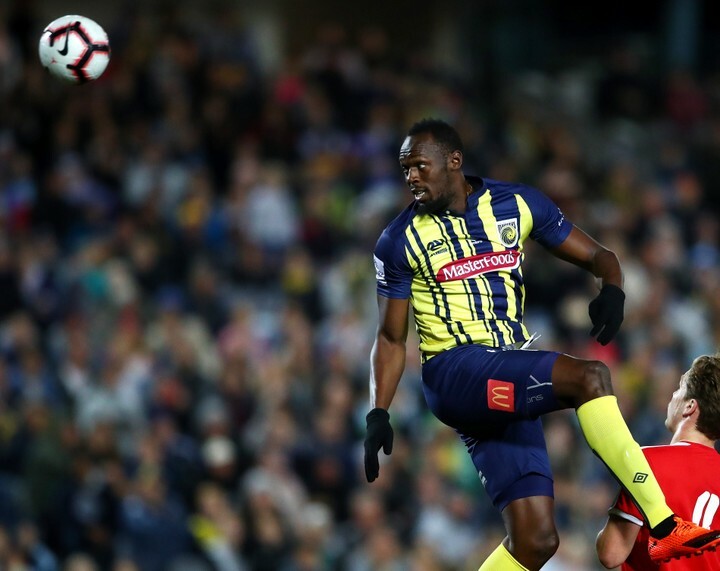 Abraham scored 23 goals in 41 appearances for Bristol in the Championship during the 2016/17 season and has lots of experience playing in England's second tier. “I’m excited for this new chapter. Aston Villa are a big club that belongs in the Premier League and I’m here to help them achieve that. At this stage of my career, I need games and this is a great place for me to come and showcase my talent. I can’t wait to get started' he said after signing his deal. 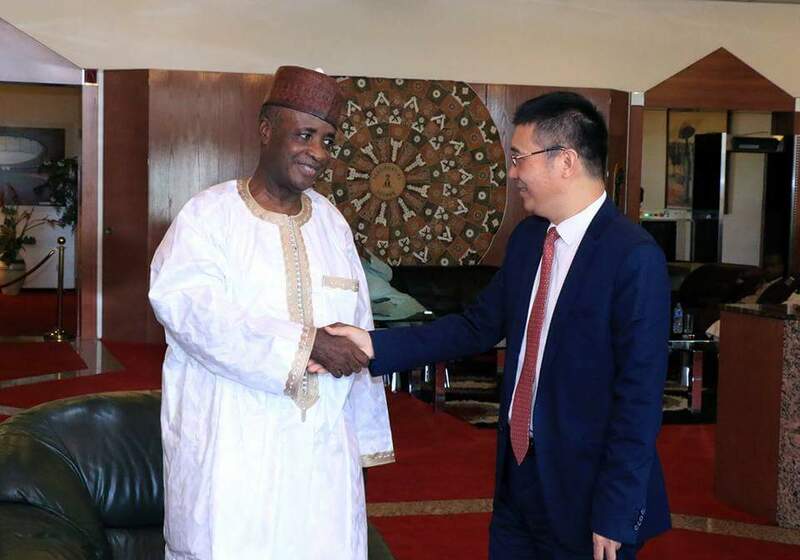 Chairman Northern Senators forum today Friday depart for China to participate in the 7th summit of the forum on China-Africa cooperation (FOCAC) shaduls to hold September 3 - 4, 2018 in Beijing. Before the formal opening (FOCAC) summit, President Muhammadu Buhari in his capacity as current chair of ECOWAS, is expected to deliver remark at the high level Dialogue between China and African leaders, business representatives and African entrepreneurs. 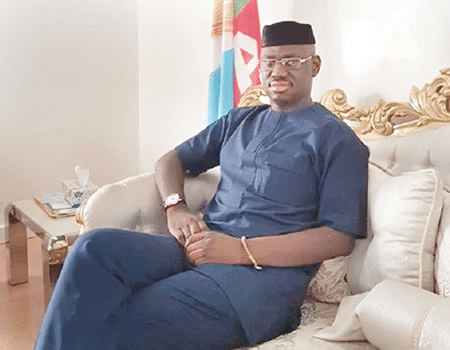 Former Deputy National Publicity Secretary of the All Progressives Congress (APC), Comrade Timi Frank, has faulted a trip to China on Friday by President Muhammadu Buhari and his party men under the guise of participating in the 7th Summit of the Forum on China-Africa Cooperation (FOCAC). 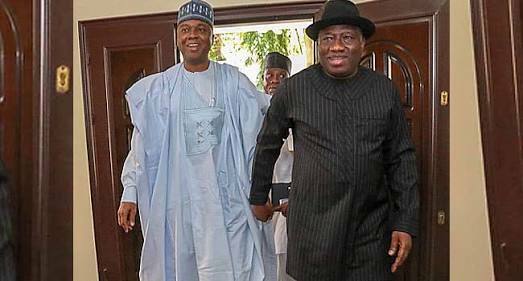 Frank in a statement in Abuja described the trip as a decoy to plot how to rig the 2019 general elections in favour of the All Progressives Congress (APC) and also perfect the renewed plot to remove the President of the Senate, Dr. Abubakar Bukola Saraki. 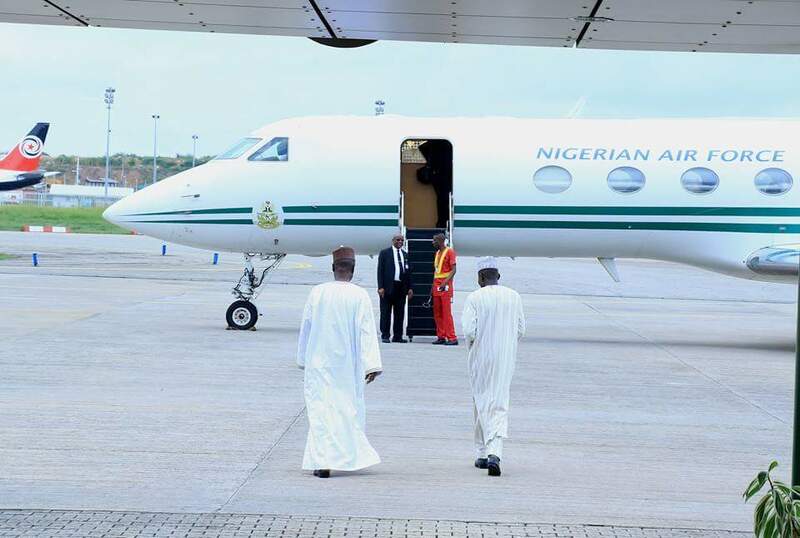 He insisted that the President has once again demonstrated his intolerance for members of the opposition political parties by only selecting APC Governors and other party cronies for the trip instead of availing competent businessmen and women of the opportunity to attend the FOCAC Summit irrespective of their party affiliations. 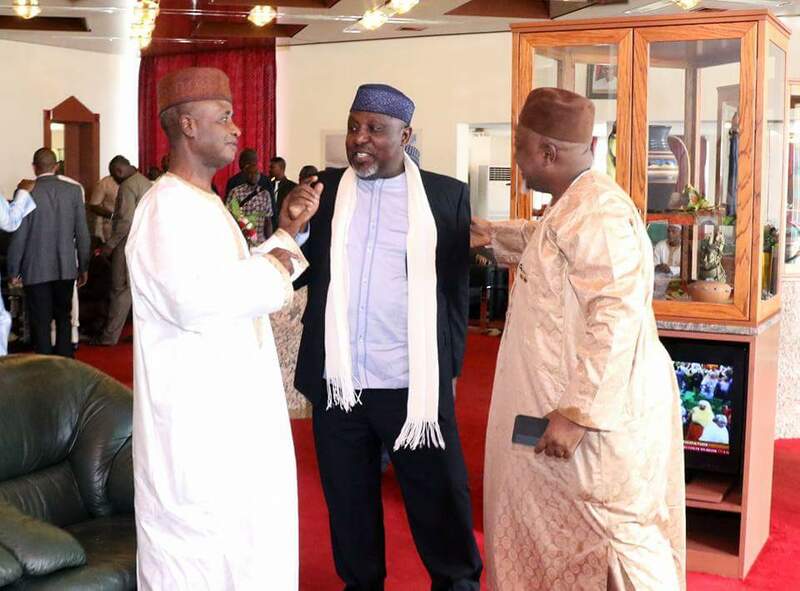 Recall that the Presidency had on Thursday released names of APC Governors, Senators and cabinet members who will be on the President’s entourage to include Governors Mohammed Abdullahi Abubakar, Akinwunmi Ambode, Mohammed Badaru Abubakar and Rochas Anayo Okorocha of Bauchi, Lagos, Jigawa and Imo States respectively. 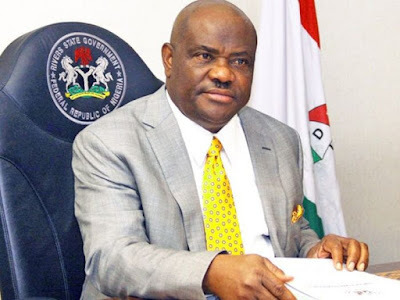 But while querying the entourage in a statement on Friday, Comrade Frank said the trip could not have been in the interest of Nigeria but that of the ruling APC on how to rig the 2019 general elections and perfect plans to effect change of leadership in the Senate. "Nigerians will recall that during the administration of President Goodluck Jonathan, no such trip was made without the presence of opposition Governors and Lawmakers. "Although, President Buhari too has traveled to foreign trips with opposition governors and Senators before now but the make up of the entourage for the current trip casts doubt on the true intent of selecting these points men of Buhari for the FOCAC Summit in China. "Our sources around the Presidency have also confirmed to us that the plot to perfect the plot to rig the 2019 elections and the removal of Bukola Saraki as Senate President is responsible for the exclusion of opposition elements from the current trip. "In an official business trip to China where business opportunities abound, one will expect a tolerant government to travel along with foremost Nigerian businessmen and women and not party cronies or leaders of the APC’s cabal in the Senate like Senator Abdullahi Adamu and Senator Godswill Apabio who are anti-Saraki's leadership. Frank, however called on Nigerians, right groups and leaders of thought to speak up on how the current administration is using the country’s resources to fund private political meetings disguised as ‘official trip’ on how to subvert the rule of law, remove Saraki and undermine the nation’s democracy in a far away country. 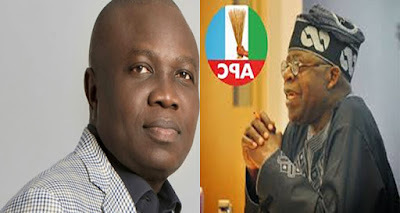 DAILY POST gathered that the governor has been in talks with key stakeholders of his cabinet following reports of a decision by the “godfather” of Lagos politics and National Leader of the APC, Asiwaju Bola Tinubu, to withdraw support from his second term bid. 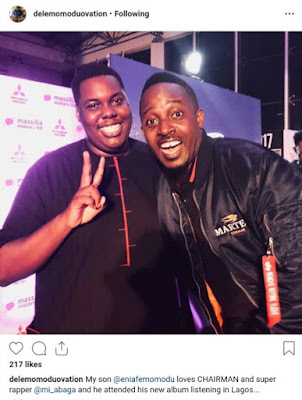 Chief Dele Momodu's son, Eniafe who is following is the reputation of his father as a journalist, pictured with rapper, MI Ababa at his album listening party in Lagos. 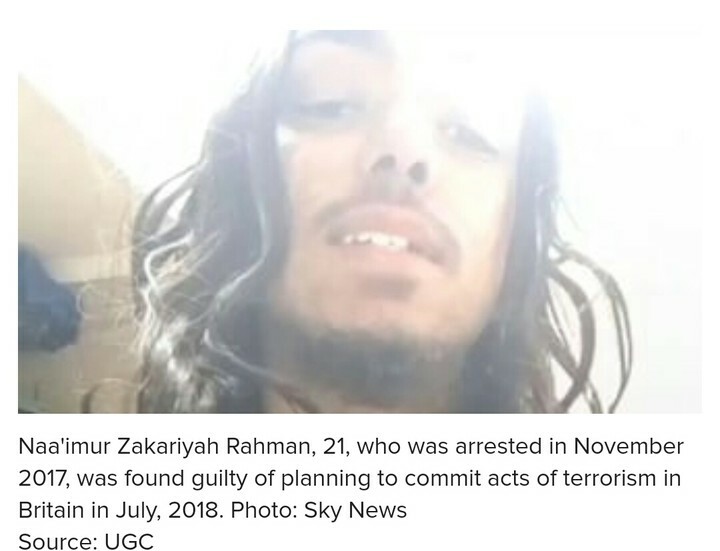 Naa'imur Zakariyah Rahman, 21, who was arrested in November 2017, was found guilty of planning to commit acts of terrorism in Britain in July 2018. 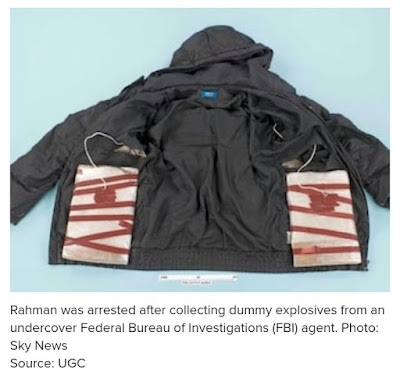 According to Sky News, Rahman was arrested after collecting dummy explosives from an undercover Federal Bureau of Investigations (FBI) agent who he had contacted him online pretending to be a terror agent. The accused had planned to bomb the Prime Minister's office gate at 10 Downing Street, kill the security officers and attack May with a knife or a gun with intent to end her life. While talking to the FBI agent who had posed as an Islamic State (IS) agent, Rahman said he planned to bomb the UK Parliament. "There are lorries here with big gas tankers. If a brother can drive it next to parliament, I will bomb," he added. Rahman came to the attention of police after he was arrested for sending indicent photos to a minor and was released but not before the police examined his phone and found potentially extremist views linked to terrorism. The sentencing of Rahman has come barely a day after May visited Kenya. She arrived in Nairobi on Thursday, August 30, where she met with President Uhuru Kenyatta at State House and held bilateral talks with other business people. 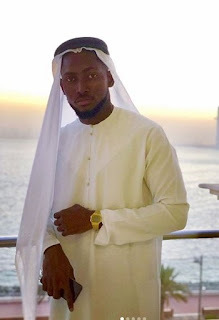 “Putting together such talented young Nigerians requires leadership and it is that leadership we have not been fortunate enough to have on a consistent basis that this country has not been able to take her rightful rightful position in Africa and indeed, the world,” he stressed. That said, the Wazirin Adamawa eulogised former Chief of Staff, Supreme Headquarters, General Shehu Musa Yar’ Adua (of blessed memory) on whose feet, he learnt the rudiments of partisan politics. “He asked us reach out to every Nigerian across the Niger. To him and for him, that was a major objective; so when he died and I decided to build the Yar’ Adua centre in his memory, we got an architect to design the uncompleted bridge. He thanked his supporters, and assured them of his commitment to job creation if voted into office as President even as urged them to accompany him to Wadata Plaza for the submission of the forms. “On that day (submission of forms), let us overwhelm the PDP secretariat, let us bring Abuja to a stand still. I bet you by the time we overwhelm the secretariat and bring Abuja to a stand still, the PDP will have no alternative than to give us the ticket,” he added. The Jamaican Ex sprinter "Usain Bolt" has officially made his bow for the A-League side, coming on in the 70th minute against an amateur team in Gosford, north of Sydney. 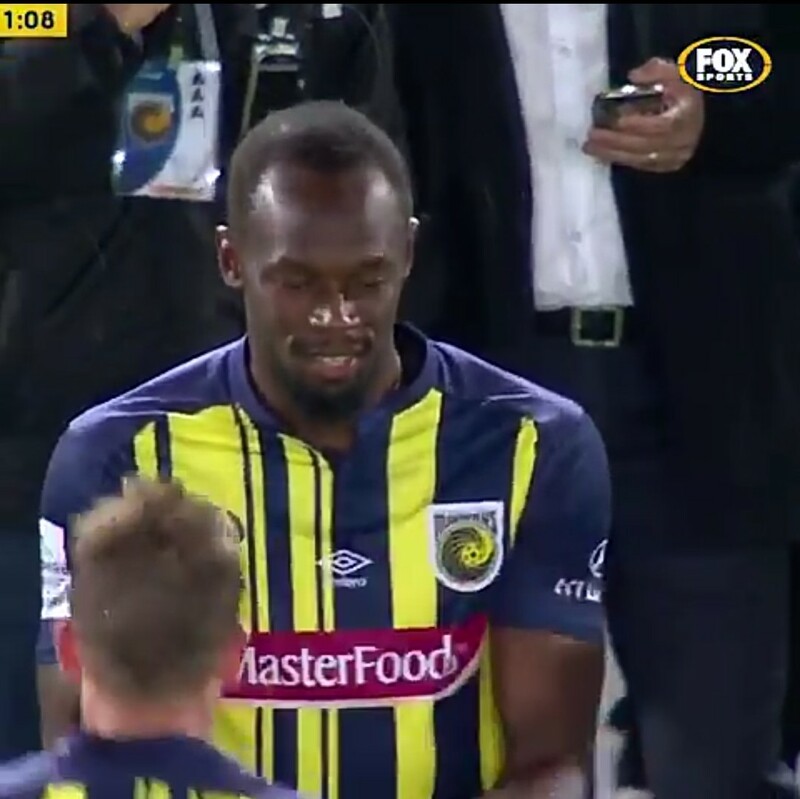 Bolt has finally realised his dream of playing professionally, even if it was a brief 20 minute cameo. He managed the following stats, completing just one pass in that time period, as well as failing to record a single shot on target. 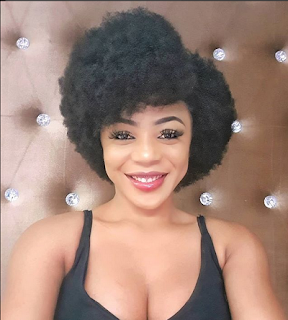 Former Big Brother Naija star, Ifu Ennada says she almost dated a guy some few months ago, but his low self-esteem was incurable hence the collapse of the relationship. 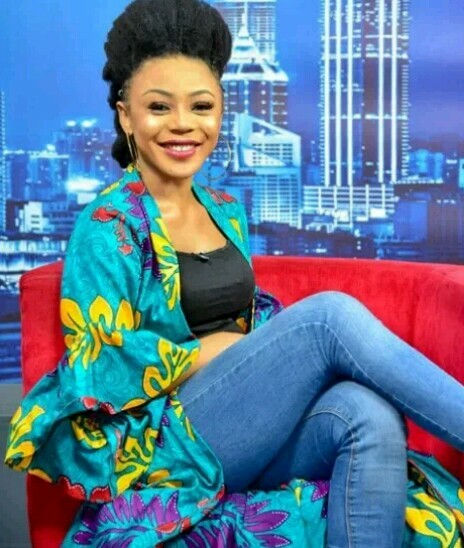 Ifu Ennada was a guest at Pulse where she got to talk about what she has been up to. When asked about her relationship status, the beautiful actress revealed that she was not only single but ready to mingle. She said, “I am not dating anyone but I want a boyfriend. Honestly, the truth is that I want to date not because of the money but because I can take care of myself. I want to date because I need a companion. Sometimes I come back from work and meetings or sometimes it could just be some mental and physical work I’m doing in my house and I could just need some hug”. Then she went on to share her experience with a guy she thinks had low self-esteem and so couldn’t handle a relationship. Ifuennada also got to talk about the recent fracas between fans of former housemates and how she joined in appealing for these guys to call a truce. 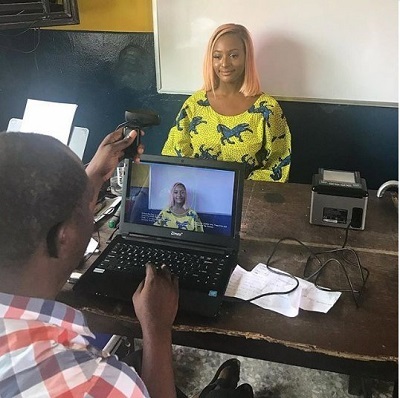 An aggrieved Nigerian Ifeoma N Chukwuogo has narrated her ordeal at the INEC Centre where she had gone to collect her permanent voter’s card. 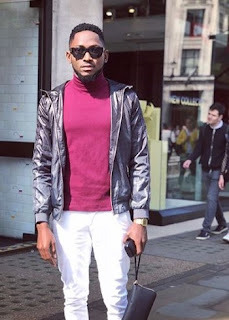 She wrote: RE this Cuppy thing..truth is, highly privileged people are rarely concerned with life outside their bubble. A man beside me just about to go in had been there since 4am or so. Of course, folks were muttering under their breaths about the unfairness. She’s not a diplomat/politician, she’s just wealthy. If you don’t want to join us like cattle standing for hrs getting harassed by officials, arrange for a private registration at a location of your choice. There’s nothing wrong with that. Companies and residential estate arrange for INEC officials to come register their staff/residents for convenience sake. But I’m guessing there was the PR aspect of it too because her handlers photographed it. No crime in that. She’s an influencer. What made me realize how tone-deaf she might be was how despite the obvious frustration from people’s facial expressions, and me actually loudly telling an INEC official in her presence that it was unfair to do that at our expense as we all have places to be as well is that she was smiling and chuckling through it all. I was looking straight at her as I was saying these things, not even in a combative manner, more in a “she/you guys should be doing better, leading by example” type stuff. 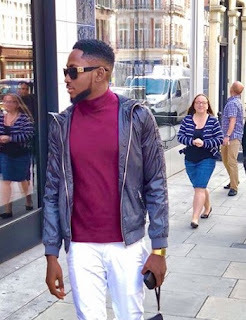 There are speculations that Miracle went with Nina as his “partner” as Nina also was spotted in London and Dubai during this period. President Buhari today August 31st, received the visiting German Chancellor, Angela Merkel, at the Presidential Villa, Abuja. 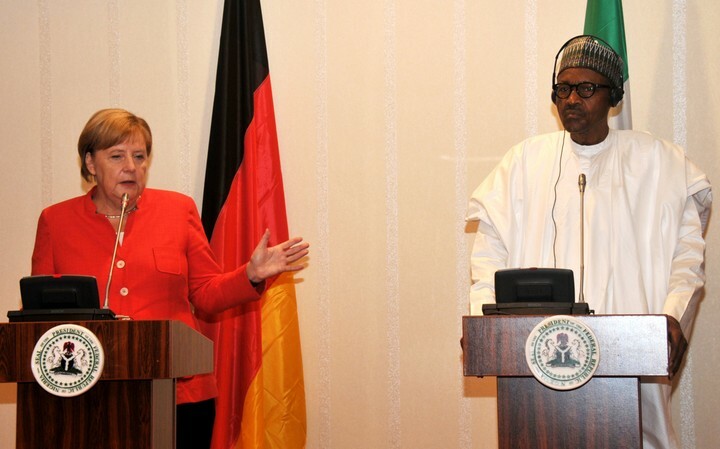 The German leader, who is concluding her tour of three West African countries, arrived Aso Rock at about 10.02a.m. Both leaders after the usual pleasantries, entered into a closed door meeting to deliberate on issues of mutual interest to both Nigeria and Germany. 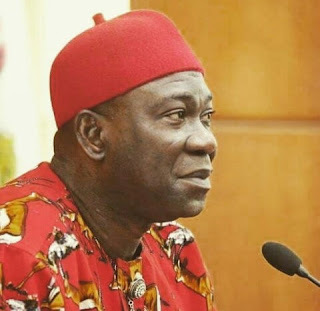 Deputy Senate President, Ike Ekweremadu, has said he could remain in the senate for the rest of his life if he so wishes saying he's always in touch with his constituents, and could easily win elections. He spoke on Thursday at Sheraton Hotel at a public dialogue organised by the #NotTooYoungToRun movement, a youth group that successfully lobbied for the passage of a new law that reduced the age of qualification for political office across the country. “I’m in total touch with my people and that is why if I want to remain in senate forever, I will” Ekweremadu told young aspirants on the platform of PDP. “PDP is not a home for urban politicians, for young people. If you want to participate in politics, you have to pay your dues and the best place to pay your dues is your local community. That is where we all started from. Don’t think you will go to the House of Reps or House of Assembly by running around Wadada Plaza, it’s not going to work” he said. 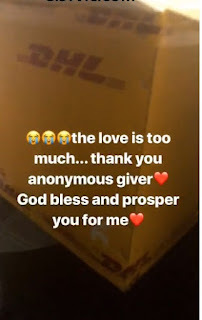 Big Brother Naija 2018 housemate, Bamike Olawunmi, popularly called ‘BamBam’ was very happy has she receives gift from an unknown lover. The wrapped gift which arrived through DHL private courier service, had a Note (probably from he sender, containing a reasonable explanation), bags, shoes, perfume, cream and other accessories. 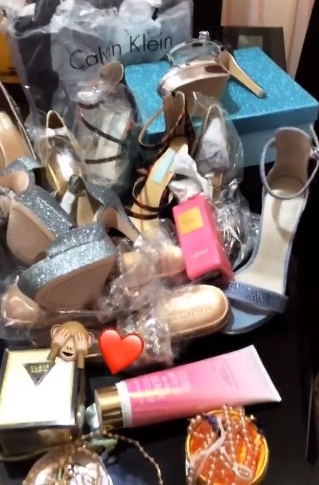 The Hair NowNow ambassador took to her instastory to flaunt the gifts and saying she is receiving too much love. She also thanked the anonymous sender whilst praying that God bless and prosper the sender for her.